In 2013, Somerset County Council introduced a new management structure to transform itself into a commissioning led organisation. The council has separated commissioning from the day to day operations. Structurally there are now 2 organisational strands, mirror images of each other, but working across organisational boundaries. Commissioning: The cycle of assessing the needs of people in an area, designing and then achieving outcomes for citizens, communities and society as a whole, based on knowing their needs, wants, aspirations and experience. Ultimately, commissioners are responsible for what we deliver; they set policy direction and the parameters for service delivery. They are also the budget holders. Somerset Libraries is an internally commissioned service. The last 3 years has been a challenging journey as none of us had worked like this before. We have talked a lot – a huge amount actually as one of the difficulties was that, rightly or wrongly, very little was understood about library services and why we do what we do. And securing greater empathy and understanding about all our activities - from the Knit & Natter groups through to our UKOnline provision - needed time. Never underestimate how much time is required to do this. For us also Somerset Libraries had reached rock bottom following the Judicial Review of 2011. The Council has a public sector equality duty to have ‘due regard’ to the equalities implications of its decision. This was the basis on which the proposed changes to Somerset’s library service in 2011 were successfully challenged. The sensitivities surrounding this experience persist to this day and it has been important to maintain good communication around the changes that we have subsequently made. Up to 2013, the library service had operated very independently and was used to just getting on and doing. The new way of operating pulled library services into the corporate scene in ways we hadn’t experienced before, and the weight of this change of direction was keenly felt. The next 18 months saw a very intensive process of data gathering and analysis, but we still had no clear strategy – everyone had a view, just very different views. We became a bit bogged down by process impeding our chances of actually getting on with the ‘doing’. Added to this was the annual budget setting process that took up most of our energies and time, not allowing us the space to develop that longer term view. Roles and responsibilities were also very blurred. In practice, we have been managing our budget and the service managers have identified options for delivering savings. We also influence strategy, but the boundaries can be difficult to define and can sometimes lead to over thinking/complicating issues. We’re much more aware of this now. We started to turn things round by holding a couple of vision and purpose sessions that involved the wider libraries management team and commissioning colleagues. How many of us have agonised over the wording of a vision statement? This is the one we came up with and it was an important milestone in the process. We started to see some light at the end of the tunnel. Somerset's Libraries are a dynamic, evolving and integral part of the community that open up a world of opportunities for reading, understanding and discovery. 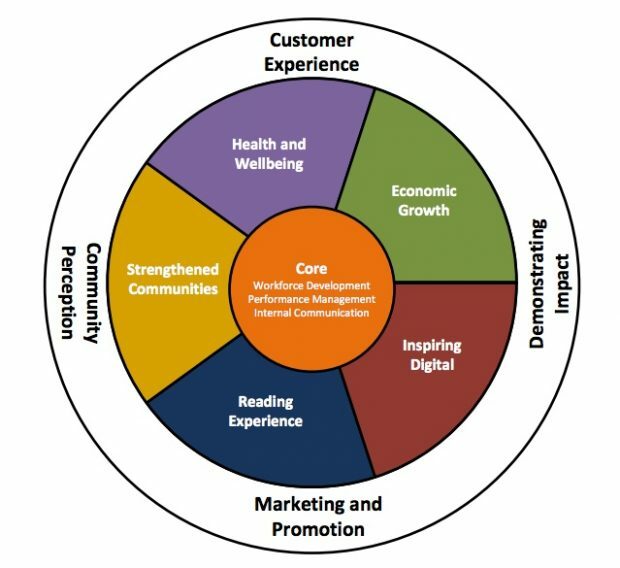 We used a reversal/de-reversal process [see below] to help shape our purpose, and we looked at our values (the county council’s 4Cs – Care & Respect; Collaboration; Customer Focus; Can Do attitude) and significant trends (e.g. 1 in 4 households in Somerset only contain people aged 65+; 100% superfast broadband to be delivered by 2020) which helped us to identify our key service activities. 1. Clearly identify the problem or challenge, and write it down. 2. Reverse the problem or challenge by asking, ‘How could I possibly cause the problem?’ As an example, you might ask ‘how can we encourage more people to visit the library’? Reverse the question and ask ‘how could we deter people from visiting the library’? 3. Brainstorm the reverse problem and list your suggestions. Rule nothing out at this stage. 4. Once you have brainstormed all the ideas, reverse them into possible solutions/starting points to resolve the original problem. The 5 high level activities have been converted into an outcomes framework to reflect each of these themes. The framework not only identifies the priority areas but asks why they are important and poses questions designed to prompt the service to demonstrate impact. The process hasn’t finished – a whole new performance management regime is beginning to take shape. However, it is already helping us to explain why we do what we’re currently doing and has helped us to justify/shape new initiatives and services. Strategically, the outcomes are a great way of telling the story to other services and partners whose understanding about the benefits of a modern library service delivery may not have kept up. They help inform our own service planning processes and provide the rationale for all our staff about service changes and developments. We are a key stakeholder in a One Public Estate programme helping to influence a greater level of service integration and the design of public facing spaces incorporating a wide range of public services. We are now working with a new commissioning manager who wants to take us to the next level – joint commissioning - so that libraries are really delivering to the council’s overall priorities. A commissioning structure needs to work across corporate and service boundaries. At times of change, it’s too easy to keep your head down but the barriers need to be overcome and, as an individual service representing just over 1% of the council’s total revenue expenditure, our commissioning structure gives us a voice. Commissioners representing key council priorities around social care and health and wellbeing are acknowledging the role libraries can play in promoting independence and helping with the small stuff before it has a chance of becoming something bigger. Libraries are an asset, not just a cost. We face the same challenges as many others in terms of managing the increased demand for savings, sustaining a motivated and confident workforce, acknowledging constraints, whilst maintaining a forward momentum. Our commissioning journey has been running parallel to a number of service specific changes. We have implemented a management restructure which was probably the most radical change the service had experienced for decades. We have also introduced a new Library Management System, expanded the LibrariesWest consortium, modified opening hours, opened our first Library Hub and reorganised our front line management team. The programme of activities and drive for innovation is probably the highest it has ever been. Our events calendar illustrates this very clearly. The journey is not yet complete but we have a more informed position from which we will mature and evolve. Keep up to date with activities in Somerset libraries by following them on twitter. Would it be possible to have Sue's contact details please. I am currently working on a very similar project at Swansea Council and would welcome a conversation with Somerset or any other Council working on a similar initiative, I am particulalry interested in workforce transformation. Thanks.